Many of us found ourselves fishing in the rain last week. I was with a friend on the lower Choptank River last week enjoying some striped bass topwater action — the fishing was fun and the overcast weather showed us one of nature’s many moods to be enjoyed. Often less-than-perfect weather gives us a unique perspective on the world around us. As we all know, the fish do not care if it’s raining and low light conditions can be beneficial. Heading into Memorial Day weekend it looks like we’ll have a little respite from the rain. Whether you will be heading to the mountains of Maryland, to the coastal areas, or staying closer to home, be sure to spend close-up time with those dear to you. There is no better way to do that than fishing together. Expect some reduced water clarity and poor oxygen conditions from the die-off of a large algal bloom in some areas of the bay for at least the next week. However, anglers will experience drier, sunnier conditions until the weekend when the chance of rain increases through Monday. Areas impacted by the recent algal bloom, or “mahogany tide” — on the western shore from north of Sandy Point south to near Kent Point and the Magothy, Severn and South river areas — continue to experience poor oxygen conditions below depths of 15 feet to 20 feet. The bloom is not a threat to human health. Near the mouth of the Choptank River, better oxygen conditions are found in the center channel and east side of the bay. From Cove Point south, and in most areas of the Potomac River, there is adequate oxygen throughout the water column. Main Chesapeake Bay water temperatures are holding steady near 70 degrees as reported from the NOAA buoys at Annapolis, Gooses Reef and Point Lookout. Expect the warmer, sunny, and dry weather during the first part of this week to increase water temperatures above the 70 degree mark. Expect below average water clarity moving down the upper bay and in the Back, Bush, Gunpowder, Honga, Middle, Potomac (down near Colonial Beach), and Nanticoke rivers, and along many streams entering the bay as a result of the recent, heavy rains. There will be above average tidal currents Friday through next Tuesday as a result of the full moon on Tuesday, May 29. A week’s worth of heavy rain has caused the upper bay region to have areas where the water is stained from runoff. Up near the Susquehanna Flats area there is also floating debris. 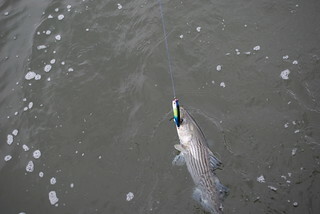 Despite stained water there has been good fishing for slot-sized striped bass in the Susquehanna Flats designated area. Striped bass are being caught on topwater lures, soft plastic jigs and crankbaits. 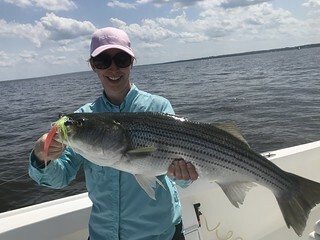 Farther down the bay there has been fairly good trolling success for striped bass above and below 28 inches in length at the Triple Buoys, Love Point and Podickory Point. Chumming has also become a popular way to fish at these same locations; anglers are reminded that circle hooks are now required along with other new information about striped bass fishing. The Bay Bridge piers and rock piles are holding striped bass and most are jigging with good success, and the sewer pipe has also been a place to set up for chumming. Current water temperatures in the middle region of the Chesapeake Bay are about 67 degrees this week and about 5 degrees warmer in the tidal rivers. Striped bass can be found this week in a wide variety of locations and depths. Trolling along the channel edges is still very popular and most are pulling a mixed spread of large and medium sized lures. Waters are off-color in many areas so chartreuse and dark lures are a good choice. Both sides of the shipping channel have been good places to troll with the steeper edges being the best places to troll. The steep edges from the Bay Bridge past the Brick House Bar, Bloody Point, Buoy 83 to the CP Buoy on the eastern side of the bay and Thomas Point to Chesapeake Beach on the western side. Chumming and chunking has become popular and the outside edge of Hackett’s Bar and near the Hill. Jigging is a very effective way to fish now and good striped bass fishing can be found along channel edges where fish are suspended. Many are using large soft plastic jigs with 8-inch to 10-inch plastics on 2-ounce jig heads. Ideal water temperatures have opened up the shallow water fishery for those who love to cast topwater lures with spin, casting or fly tackle. It is a very effective way to fish along shoreline structure and stay above the grass beds. Mornings and evenings often offer the best action and a good flowing tide is important. The rock walls of Poplar Island are a great place to try your luck and many of the prominent points at the mouths of the region’s tidal rivers offer some great topwater fishing opportunities. 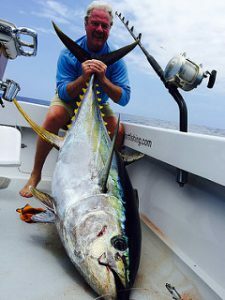 Throwbacks are often part of the equation but offer some fun catch-and-release fishing. The excitement of large striped bass moving through the area at any given time always creates a lot of anticipation. White perch fishing is perhaps at its zenith this month. Water temperatures are about at a perfect comfort level for the white perch and the larger perch are feeding aggressively after the spring spawning process. They can be found in the lower sections of the tidal rivers throughout all regions of the bay usually near some kind of structure. Docks and piers are ideal places to find them and make for some wonderful fishing from shore. The best way to fish is with fresh grass shrimp on a small jig head or shad dart, or a simple one-hook bottom rig, worked close to dock pilings or bridge piers. Bloodworms will work well, also on a bottom rig. Casting small spinners and spinnerbaits near shallower structure in the mornings and evenings with ultra-light tackle is another favorite. Casting small Clouser shrimp flies is another fun activity with a lightweight fly rod. Trolling a mixed spread of different-sized lures along the shipping channel edges remains one of the most popular way to fish for striped bass this week. The western edge of the channel from above Cove Point south to Point-No-Point and the eastern side from CP Buoy south to Buoy 68 have been great places to troll. In the lower Potomac River, the steep edge in front of St. Georges Island and Piney Point have been hot spots. 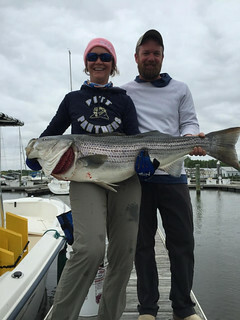 Those fishing in the Potomac need to remember that the minimum size for striped bass in the main stem of the river is 20 inches, but it is 19 inches in the Maryland tributaries. The water can be off-color due to runoff so dark colors and chartreuse have been popular lure colors. Now that medium-sized striped bass are in play, jigging along some of the same channel edges has been a great way to catch striped bass on light tackle. The striped bass can often be found suspended on channel edges with a good depth finder. Chumming has been effective in the lower Potomac near St. Georges Island and Piney Point, as well as locations along the edges of the shipping channel out in the bay. The shallow waters near the mouth of the Patuxent River and the marsh edges along the Eastern Shore are providing a lot of fun, light-tackle shallow water action. Casting topwater lures is always fun but swimbaits are also effective. Drifting baits in some of the cuts on the Eastern Shore is a good way to fish but the cownose rays will soon be on the scene making this a hazardous way to fish. A few puppy drum and speckled trout have been part of the mix when fishing for striped bass. The first croakers have been reported in the Point Lookout area. Fishing for a mix of white perch and blue catfish has been very good at the Bushwood/Wicomico River area this week. The white perch are being caught on bloodworms and the blue catfish on cut bait. Recreational crabbing has been poor at best and many of the tidal creeks are clouded with mahogany tide algae blooms. Typically the tidal rivers and creeks on the lower Eastern Shore will offer the best opportunities for crabs this time of the year but there tends to be no bargain there this week. Recent heavy rains have caused the upper Potomac River and other rivers, such as the Monocacy, to be unfit for fishing. Many of the smaller creeks and streams in the western region are beginning to settle down and although running brisk, offer good trout fishing. The stocking crews are still out and placing trout in many of the trout management waters in the western region of the state. A quick check of the trout stocking website can offer some of the better trout fishing opportunities this week. Walleye fishing at Deep Creek Lake continues to be very good for those drifting live minnows or using a jig/minnow combination along deep grass edges. Large yellow perch and smallmouth bass can also be part of the mix. Largemouth bass are holding near floating docks and northern pike and chain pickerel can be found in the coves. Many of the reservoirs in the central region are providing good fishing this week, most have not been too effected by runoff from recent storms. Fishing for largemouth bass is very good in most impoundments from the largest reservoirs to the smallest farm ponds. In many areas the female largemouth bass are done with the spawning process and are aggressively feeding just outside of the spawning bed areas. One can cover a lot of area with spinnerbaits in transition areas, crankbaits and jigs are a good bet near deeper structure as are stick worms and soft plastics in the grass beds. Topwater lures and lipless crankbaits work well in the shallower areas. 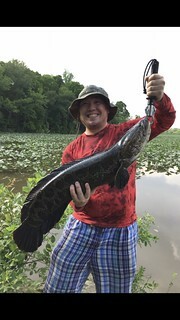 In many areas northern snakeheads will also be encountered in shallow areas around grass beds in many of the Chesapeake Bay’s tidal rivers and creeks. Fishing for crappie continues to be good in ponds, lakes and tidal rivers throughout Maryland. They can often be found near structure is deeper waters and caught on minnows under a slip bobber, small jigs and spinnerbaits. Blue catfish can be found in the tidal Potomac and Patuxent rivers and caught on cut bait, and most of the bay’s tidal rivers and creeks have healthy populations of channel catfish. 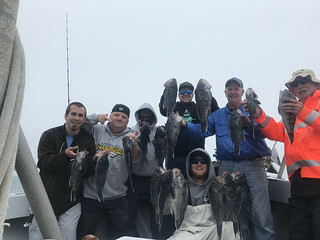 Despite some lousy weather, surf casters have been enjoying some good fishing for large bluefish, striped bass and black drum. Most are using cut mullet on cork float bottom rigs for the bluefish and striped bass. The medium-sized black drum are being caught on clams and sand fleas. A few kingfish are also showing up in the surf and are being caught on bloodworms. Clear-nosed skates and spiny dogfish are reported to be pesky bait stealers at times. 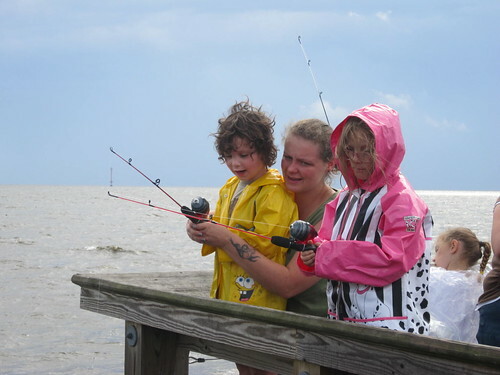 Rain and wind hampered fishing in the back bays causing cloudy water conditions so flounder fishing has been poor. Bluefish have been moving in and out of the inlet and are being caught by drifting cut bait or casting metal and swimshads. Outside the inlet, boats have managed to venture out to the offshore wreck and reef sites for sea bass. Some sites have good numbers of sea bass and others are slim. Clams tend to be the preferred bait. There were recent dockside reports of at least one mako shark caught out near one of the 30 fathom line sites.